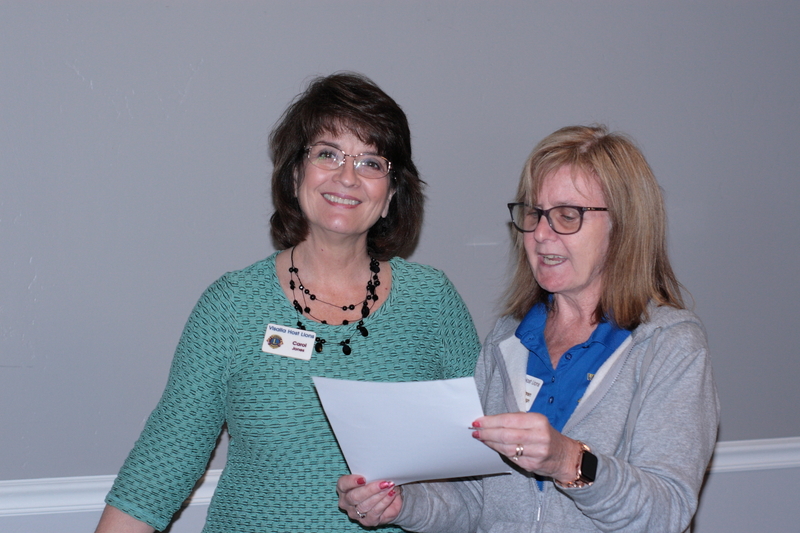 Club President Karen McVaigh opened the meeting by asking Lion Bob Line to lead the Club in a patriotic song – America, My country Tis of Thee. Lion Ed Jones led the Pledge of Allegiance and Lion George Fry performed the invocation. Greeter Melinda Blankenship introduced our guests: Betsy Leon, D’ Ann Reimer, and Rebekah Zelewski of Visalia Rescue Mission. Lion Carol Jones received a Chevron Award for 30 years for service as a Lion. President Karen announced that the next Executive Board meeting will be at 5:30 PM on February 6th at Left of Center. She also shared that Visalia Pride Lions will be having its annual Valentines Dinner Dance. Lion Melinda Blankenship reported that Sunset Lions is having a fundraiser at the Planing Mill Restaurant on February 12th. Lion Dee Baughman shared that his singing quartet, Some Assembly Required, will be delivering singing Valentines again this year as a fundraiser. Lion Ed Jones auctioned off a Stuffed Lion from his recent trip to Morro Bay. Lion Tom Gaebe bought the Lion for a donation of eleven dollars. Lion Melinda Blankenship donated twenty happy bucks. The escrow is closing on her new house. Lion Ruth McKee was happy that it was Friday. Lion George Fry was very happy to be back in our Club and donated seven happy bucks. Lion Bob Line’s youngest granddaughter will be married tomorrow. 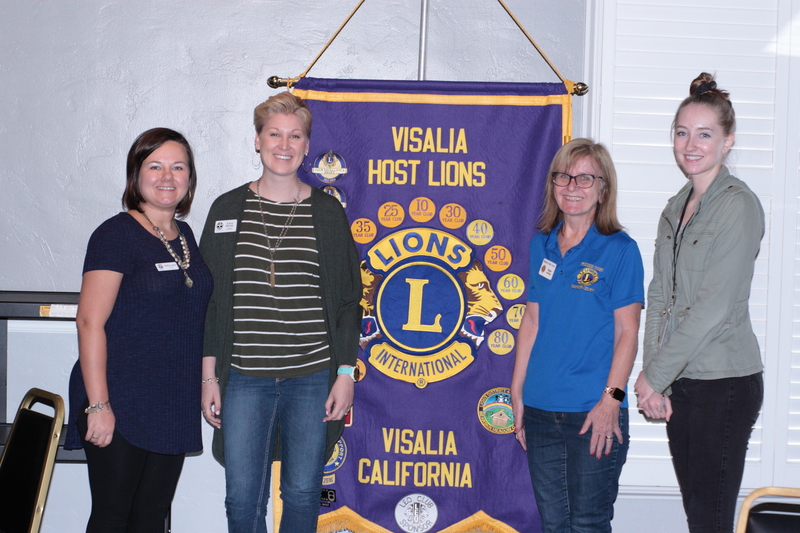 President Karen was happy that Lions Laurie Aguilar and Tony Loliva were at a visitation to Visalia Breakfast Lions. Lions Carol and Ed Jones had a great trip to Morro bay and were happy to see Lion George back at Club. Boston fan Lion Allen Ventling was happy that the Patriots in the Super Bowl. Lion Allen will be heading to Vegas after the meeting. Lion Vicki Whitehouse donated five happy bucks – her husband continues to do well and she was happy to be sitting with our guests from the Visalia Rescue Mission. Lion Tom Link was able to get two sponsors for the Mystery Dinner. Lion George Fry fined Lion Tom Link. Lion Tom used to sell him socks years ago but has long since retired. Lion Dee fined Lion Allen Ventling for his use of “French” during the meeting. Lion Vicki fined Lion Brent Robinson for stealing her usual seat. Lion Ruth Mckee fined Lion Allen Ventling for failing to wear his badge last week. Lion Tom Link fined Lion Carol Jones for allegedly sending his a laughing Teddy Bear over Facebook. Lion Bob Bricker won the five-dollar raffle and donated the proceeds to the La Sierra Leo Club. Lion Ruth Mckee won the lottery tickets. Lion Roy Dressel took the free ad. Lion Vicki Whitehouse won a shot at the marble drawing but failed to find the coveted white marble. Betsy Leon, D’ Ann Reimer, and Rebekah Zelewski described the services they provide at the Visalia Rescue Mission. The Mission will be having its tenth annual Empty Bowls fundraiser on February 19th at 6 PM.